Deeside Dragons were the visitors to The Hive on Sunday evening as the Widnes Wild looked to continue their unbeaten home run to 8 games without loss. 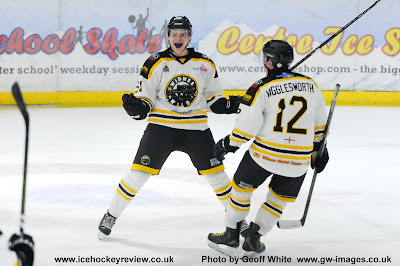 A win for the Dragons would see them crowned Laidler Conference Champions. The biggest crowd of the season would pack themselves into Silver Blades Widnes to witness one of the most exciting games ever to be played in the building. It would be the Welsh side that would take the lead within 7 seconds of the opening face-off. A quick shot squeezing through Wild netminder Greg Ruxton’s pads putting the Wild on the back foot. Penalty trouble for the Dragons would give the home side a man advantage and with their ever dangerous powerplay, the Wild would score 3 unanswered goals from Scott Mckenzie, Shaun Dippnall & Kieran Strangeway to end the period with a deserved 3-1 lead. The Dragons however would come out fighting in the 2nd period, scoring 3 quick goals to turn the game on its head and make it 4-3 in their favour. Head Coach of the Wild Scott Mckenzie would call a time out to regroup his players. This would eventually pay off as yet again another powerplay goal would see Michal Fico on the scoresheet. Another goal for Deeside would end the period in a disappointing fashion and leave coach Mckenzie with some words for his players in the changing room. Whatever Mckenzie said, worked. Again turning the game on its head Kieran Strangeway scoring twice to gain his hat-trick but also give the Wild a 6-5 lead with 10 minutes to go. All season the Dragons have been known for their offensive threat and speed going forward. Two further goals would provide the visitors with a 7-6 lead with just minutes to go. The Dragons looked like they would close the game out but again Kieran Strangeway would find space to shoot past the Dragons netminder and tie the game at 7-7 and send the Wild fans into rapture. The game would end at 7-7, both teams providing a night that you could never put a price on. Players giving everything they had to win a game of ice hockey. Both sets of fans left Silver Blades Widnes happy with a point but also happy with their evening of entertainment. It’s a weekend off for the Wild as the players get a chance to take some rest and spend time with their families. They return to action with 2 away games against Blackburn Hawks & Blackburn Eagles on the weekend of the 27th and 28th of February. For more information email scott.mckenzie@widneswild.co.uk.